Sussex cricket manager Mark Robinson is under pressure after relegation from Division One this season, according to former captain Chris Adams. The Hove side saw their five-year stay in the top flight end last month. "Mark has got work to do, in putting together a team which will go back into Division One and compete again for one-day trophies," Adams told BBC Sussex. "Speaking as someone who lost a job after four-and-a-half years, you're never fully secure." Adams spent 11 years as captain of Sussex and led the club to three County Championship titles in the 2000s - with two of those coming with Robinson as coach. 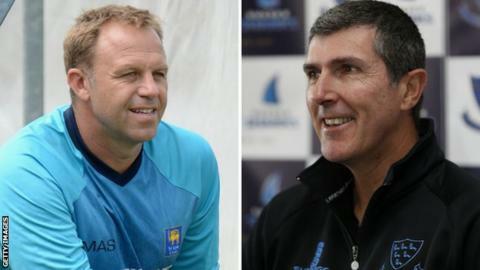 He left Hove at the end of 2008 to join Surrey as team director, a post he held until June 2013. "I still follow Sussex intensely and I am gutted," Adams said. "It has been a while since there have been trophies at Sussex. It is time for an injection of something. "Mark has got decisions to make. He won't be making them on his own as the chairman and chief executive will be involved as well." Robinson is adamant that Sussex can return stronger and said that the drop was "not the end of the world" for the club. Since leaving Surrey, Adams has since spent time working with Sri Lanka and the Netherlands and says he "would love" the opportunity to return to Sussex. "Sussex gets in your blood and I feel it is a huge part of me," the 45-year-old added. "I've discussed it with the people that make the decisions at the club. It doesn't have to be in one of the few leadership roles - it could be in a support role. "I love coaching cricket and helping teams win. But Mark Robinson will have his own ideas about what constitutes a winning team."